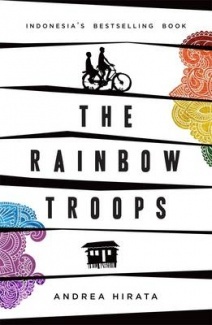 It would be easy to be dismissive of this book: The Rainbow Troops is sentimental, moralistic and hagiographic. The unsubtle proselytising of Islam is irritating, the representations of people are like cardboard cut-outs, and the writing is very ordinary indeed. None of this prevented it from becoming a best-seller in Indonesia, where its theme of rich v. poor is a running sore. The pupils of a small rural school threatened with closure battle the rich and powerful, and they win. It makes people feel good to believe that this can happen – that tin-mining giants and corrupt unfeeling bureaucracies will be overcome by pity and remorse; and that rich kids will cross the social barriers to abandon their privileged situation, all for love. A rags-to-riches story like this would be quite harmless, if only it didn’t encourage the status quo amongst privileged readers who will buy the take-home message that if you work hard and believe in yourself, (and pray in the right way at the right time) you too can survive and rise out of poverty. Marketed on the Random House Australia website as contemporary fiction ‘in the tradition of Slumdog Millionaire and Shantaram‘, The Rainbow Troops is, according to the author bio ‘heart-warming’ marketing at GoodReads, the author’s ‘own story’. Narrated in first person it never quite resolves its own voice, which moves from child to adult, with naïve adolescent in between. It seems to be an uneasy blend of memoir and fiction by an author who hasn’t mastered his craft. So it’s useful for Australians to read a novel by an Indonesian author, especially one who provides a graphic illustration of one of its major problems, the gulf between rich and poor. Ikal and his friends are determined to keep their school open because they know that education is the only way to change their life opportunities. Their poverty is extreme, measured by the number of buttons remaining on a shirt, and the school operates on a shoestring so that the kids can graduate from sixth grade, literate and numerate as their parents never were. The book may not be great writing, but it’s accessible and interesting and it may be the first book that Australians have ever read by an Indonesian author. It’s also good to see one of the big publishing houses taking an interest in translated books from our nearest neighbour – well done, Random House Australia! Please also visit Andrea Hirata’s website where you can see enthusiastic responses to this book from no less than Thomas Keneally and admire the 2013 New York Book Festival General Fiction Book Prize Award stickers. PS If you want compelling evidence that confirms Linda Jaivin’s assessment of the merits of machine translation, visit the GoodReads reviews of this book, copy and paste the Indonesian ones into Google Translate – and try not to laugh. Source: Personal library, purchased from Benn’s Books Bentleigh. I wonder about the effects of translation on the readability of this book. I enjoyed it. It’s a plug for good teachers and education as a child’s right. It’s not smooth but it’s fun and it highlights the waste of bright minds, and bonds between school children. “I have seen it everywhere: the most unfortunate in this world are the pessimistic.” !!! Well, you could be right about the translation, though IMO it’s not hard for an English speaker to translate Indonesian into good English; it’s one of the easiest languages to learn. And maybe some of the decision-makers in Indonesia have been shamed by it into making better provision for education in rural areas, that would be good!